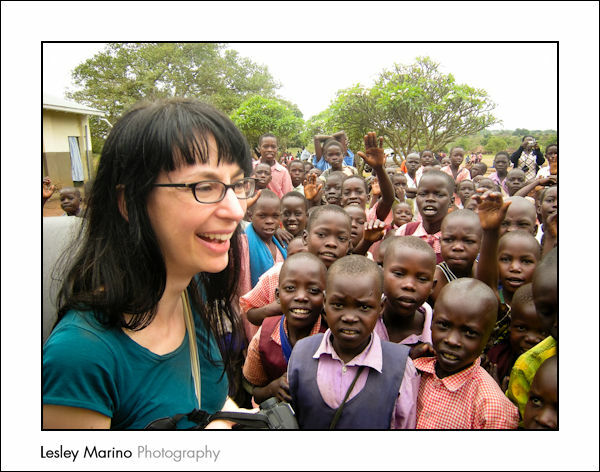 It’s been two weeks now since I returned from my trip to Uganda with the Ryan’s Well Foundation, but it is still constantly on my mind (and not just because I have so much editing to do!). What I experienced well-exceeded the hopes and expectations I had for the trip. I was thrilled to visit the communities and schools where Ryan’s Well and their partners work and directly see the impact of their work on the people in these areas. 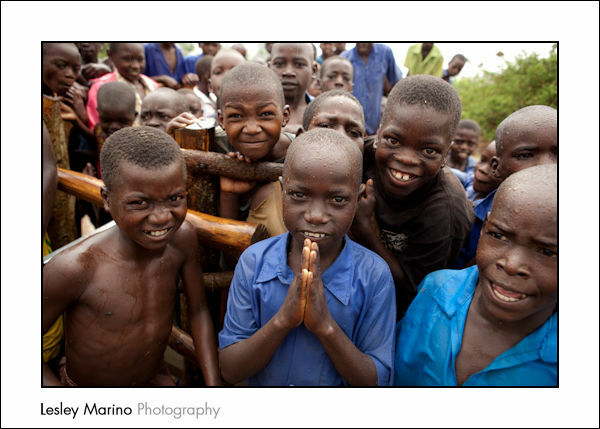 Being greeted by the students at Adekokwok Primary School outside Lira, Uganda. 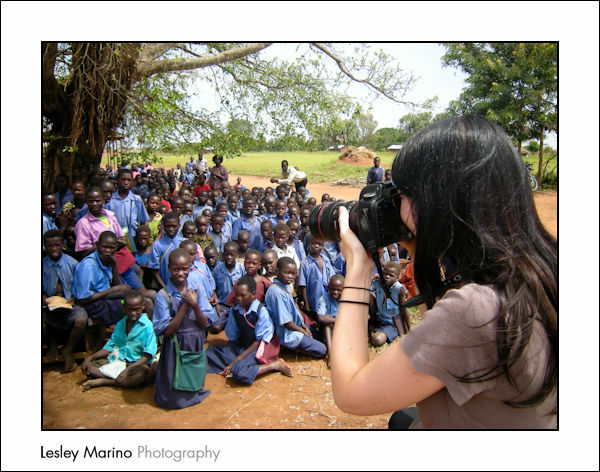 Photographing the students of Onyut Primary School. I myself am sincerely grateful to all those who donated to my project, donated directly to the Ryan’s Well Foundation, attended the fundraiser on such a cold night, donated items for the auction, and offered such encouraging and supportive words! And a huge thank you to the Ryan’s Well Foundation board members, the Hreljac family and Julie Truelove for having allowed me to embark on this trip. Early Tuesday morning we left Kampala on a seven-hour drive to the Rukungiri District in the southwest. Formed in 2002, the Ruhinda Women’s Integrated Development Foundation (RWIDF) is a community-based women’s organisation with a mandate to enhance the skills, livelihoods and well-being of women and youth in order to mobilise communities and increase awareness of water, sanitation and hygienic standards and other health-related issues. After spending our first week in Lira, we travelled west, sharing the road with numerous trucks headed to Sudan, to spend the weekend at the Paraa Safari Lodge in Murchison Falls National Park. We arrived late on Saturday, with just enough time to enjoy a beverage by the pool and watch the sun set. We woke early Sunday morning to go on a 4-hour game drive. Our ranger, Tigris, was very knowledgeable and had the eyes of a hawk – he helped us see baboons, patas monkeys, elephants, warthogs (Julie’s favourite), hippos, African buffalo, bushbucks, waterbucks, Uganda kobs, giraffes, hartebeests, oribis (my favourite), monitor lizards and numerous birds including ibis, grasshopper buzzards, storks, fish eagle, grey-headed kingfisher, helmeted guineafowl, oxpeckers, and many more. We even saw both a male and female lion napping in the grasses. After a quick lunch, we headed down to the launch to take a boat trip down the Nile to see more wildlife and the Murchison Falls. We anticipated a relaxing, lazy float down the river – well…it started out that way, but then the weather started getting rough (a certain TV theme-song comes to mind!) – dark thunder clouds unexpectedly rolled in. Thunder + lightning + small metal-framed boat + wind + rain + crocodiles + a 3-hour tour – life jackets = possible disaster. Luckily, the storm moved on and the weather cleared. Needless to say, we were quite thankful to make it back to shore and looked forward to an uneventful evening. However, my adventures were not yet over. After returning to my room before dinner, I noticed something a little out of the ordinary outside my sliding doors. There was an elephant standing by the pool. I grabbed my camera and shot the video at the bottom. Turn up the volume; I’m a bit quiet. Hope you enjoy!